Thank You to Our Youngest-Ever Donor! Gaithersburg HELP recognizes our youngest donor, Alexander Clare, for his neighborly generosity! Thanksgiving is a time to be grateful, and Gaithersburg HELP is especially grateful to Alexander Clare – our youngest donor! Alexander raised $130 over the summer selling his homemade chocolate truffles, and used the money to help stock our pantry shelves for the holiday season. 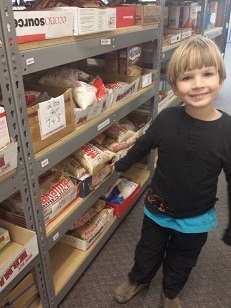 Upon touring HELP’s pantry and meeting with members of our leadership team, Alexander and his mom, Bevin, said they were impressed by the work that HELP’s all-volunteer team does every day to serve and strengthen our community. Alexander’s generous donation will help us fight hunger in Gaithersburg this winter and spread holiday cheer to our neighbors in need. We thank Alexander for embracing the spirit of giving this season!